TMS is highly desirable over ECT (Electroconvulsive Therapy or “Shock Therapy”) as ECT treatment requires general anesthesia, is usually accompanied by long-term side effects such as memory loss, and costs significantly more. 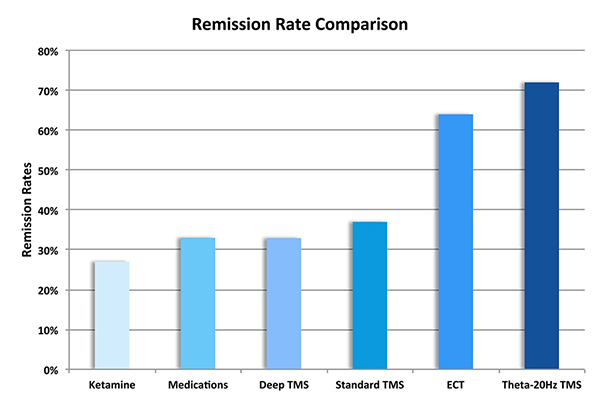 However, conventional TMS falls short in matching the remission rates demonstrated with ECT treatment. Intermittent Theta-Burst stimulation, a short 3-minute high frequency excitatory protocol approved by the FDA is a patterned form of TMS administered as pulse triplets typically at a frequency of 50 Hz (50 pulses per second). It has consistently produced longer lasting results than conventional TMS with fewer side effects. The CIM doctors may adjust the frequency based on the patient’s individual needs. In some cases 20 Hz protocols improve clinical effectiveness. On average, only one out of three of patients will completely recover from their depression after treatment with conventional or deep TMS, whereas more than two out of three patients have been reported to completely recover after treatment with Theta-Burst TMS. The efficacy and proven superior safety of Theta Burst TMS treatment make it the optimal treatment choice for patients who cannot take medication or who have failed other types of treatments for depression. Daly EJ, Singh JB, Fedgchin M, Cooper K, Lim P, Shelton RC, et al. Efficacy and Safety of Intranasal Esketamine Adjunctive to Oral Antidepressant Therapy in Treatment-Resistant Depression. JAMA Psychiatry 2018;75:139. Kellner CH, Knapp R, Husain MM, Rasmussen K, Sampson S, Cullum M, et al. Bifrontal, bitemporal and right unilateral electrode placement in ECT: randomised trial. British Journal of Psychiatry 2010;196:226–34. Dunner DL, Aaronson ST, Sackeim HA, Janicak PG, Carpenter LL, Boyadjis T, et al. A Multisite, Naturalistic, Observational Study of Transcranial Magnetic Stimulation for Patients With Pharmacoresistant Major Depressive Disorder. The Journal of Clinical Psychiatry 2014:1394–401. Olgiati P, Serretti A, Souery D, Dold M, Kasper S, Montgomery S, et al. Early improvement and response to antidepressant medications in adults with major depressive disorder. Meta-analysis and study of a sample with treatment-resistant depression. Journal of Affective Disorders 2018;227:777–86. Stubbeman W, Ragland V, Khairkhah R, Vanderlaan K. Efficacy of novel twenty hz theta burst pulse parameter in the TMS treatment of refractory depression. 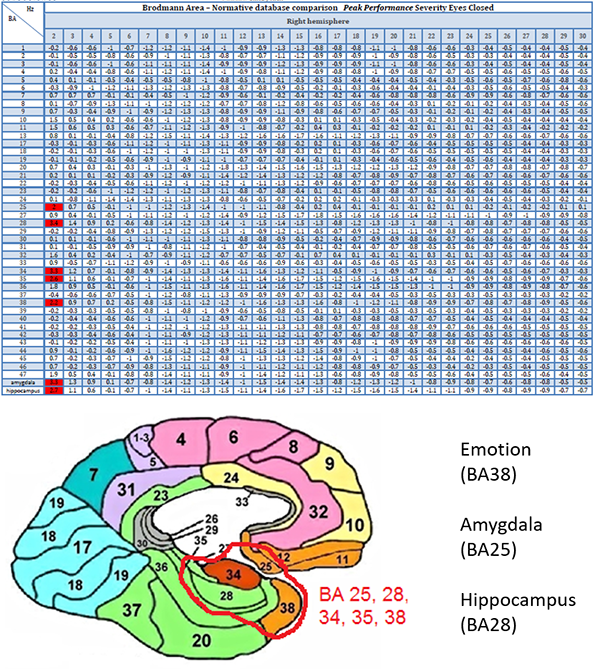 Brain Stimulation 2015;8:397–8. Stubbeman WF, Zarrabi B, Bastea S, Ragland V, Khairkhah R. Bilateral neuronavigated 20Hz theta burst TMS for treatment refractory depression: An open label study. Brain Stimulation 2018;11:953–5. Rapinesi C, Kotzalidis GD, Ferracuti S, Girardi N, Zangen A, Sani G, et al. Add-on high frequency deep transcranial magnetic stimulation (dTMS) to bilateral prefrontal cortex in depressive episodes of patients with major depressive disorder, bipolar disorder I, and major depressive with alcohol use disorders. Neuroscience Letters 2018;671:128–32. Plewnia C, Große S, Zwissler B, Fallgatter A. Treatment of major depression with bilateral theta burst stimulation: A randomized controlled pilot trial. Clinical Neurophysiology 2013;124. CIM doctors utilize a full physiology system analysis for each patient that goes far beyond diagnosis and reported symptoms. 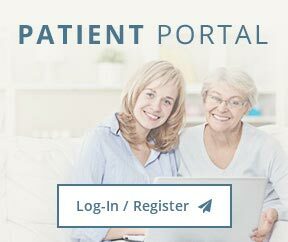 We evaluate your full electrochemical brain functions, your hormone functions and your enteric nervous system functions (your gut) because these collective systems are very important to your total brain and body health and if not optimized can produce severe depression and other related cognitive symptoms. As a result, when we determine to use the very effective TMS treatment it is done within a context of full system analysis. While most all others offering TMS use a “one size fits all” approach, we insist on an individualized brain area targeting approach using objective data to guide us each step of the way. We use a highly advanced approach pioneered by Dr. Hagedorn to quantify the specific locations in the brain that are linked to your symptoms. With this same technology we can better deliver individualized conventional or theta-burst TMS treatment and also record the changes within the brain after just one treatment session.